Washington, DC…On Thursday, September 25, at 7 PM, the National Archives presents a special screening and discussion of Breath of Freedom, the story of the one-million-plus African Americans who fought in World War II (2014; 46 minutes). A discussion including Dr. Frank Smith, Jr., director of the African American Civil War Memorial & Museum, and Maria Höhn, author of A Breath of Freedom: The Civil Rights Struggle, African American GIs, and Germany, will follow the program. This event is presented in partnership with Smithsonian Channel and the Congressional Black Caucus. They fought for democracy in a segregated army and marched as conquerors into a country in ruins. Finding a "breath of freedom" in post-World War II Germany, African-American soldiers experienced for the first time what it felt like to be treated as equals—and returned home determined to change their country. This largely unknown chapter in American history is told in Breath of Freedom, a new two-hour documentary narrated by Academy-Award winner Cuba Gooding, Jr. 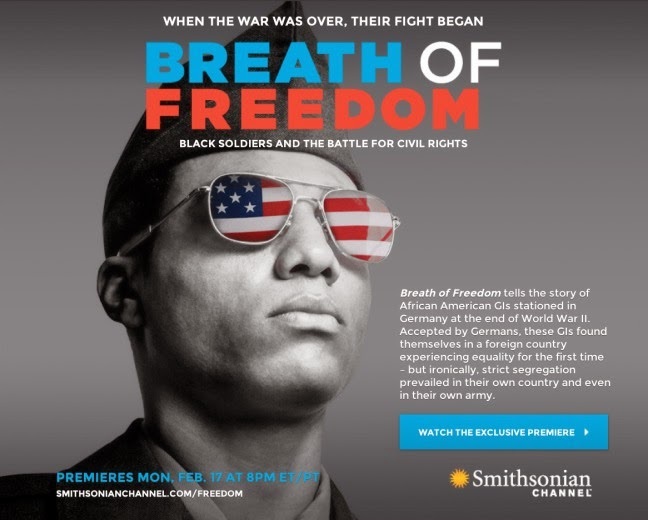 Breath of Freedom traces African-American soldiers from Normandy to the Battle of the Bulge, when American forces faced such a crisis that they had no choice but to break the rule of strict segregation and allow black soldiers to fight side by side with whites. Featuring interviews with former Secretary of State General Colin Powell and Congressman John Lewis, this is the remarkable story of how World War II and its aftermath played a huge role in the Civil Rights Movement. It’s a story told through the powerful recollections of veterans like Charles Evers, brother of slain Civil Rights icon Medgar Evers. This event is free and open to the public, and will be held in the William G. McGowan Theater of the National Archives Building in Washington, DC. Attendees should use the Special Events entrance, located on Constitution Avenue at 7th Street, NW. The building is open 10 AM–5:30 PM daily, and is fully accessible. Metro: Yellow or Green lines, Archives/Navy Memorial station.